Weeks like these I’m very glad to be ahead in my reading goal. I didn’t know this was a children’s book. I just knew that it was nominated for a 2018 BC Book Prize. That it is a children’s book I figured out in the first few paragraphs, unlike, for instance, by the fact that it was nominated for the Sheila A. Egoff Children’s Literature Prize. Anyway, the book is a biography-as-novel that tells the true story of Harry Jerome, a kid from Winnipeg whose family ends up in Vancouver, and who goes on to crush the 100 metres in the 1960s, earning the title World’s Fastest Man. There’s an excellent bronze statue of him at the 1 mile marker on the Stanley Park Seawall. I liked this book because I like Harry Jerome. I also like how well Norma Charles did capturing and presenting the ugly racism that Jerome faced throughout his career, and especially her presenting it in a way accessible to young readers. The book is a quick read–it is a children’s book after all. I think it’s worth reading at any age. I’ve made habit of late of linking the book I write about back to its publisher’s page whenever possible, and I have here as usual. I wanted to buy my copy straight from Red Deer Press. The problem is that the list price for the book is $12.95 but the shipping was an additional $19.07 so I bought it from the devil for $12.95 plus free shipping. I still feel bad about it. Sort of. Slacking off in the sunshine. Weeks like these I’m very glad to be ahead in my running goal. I’m 331 KM ahead of pace to reach 2,018 KM this year. However, I am 329 KM behind pace to reach 2,018 miles this year. And if I’m going to achieve my BQ goal in twelve weeks I’m going to need to have no more 47 KM weeks for at least the next 10 or so. The excuses for the paltry running this week are threefold. First, I spent today, AKA long-run Sunday, at the office, and now I’m typing instead of running. Second, instead of 8-12 KMs of hills on Thursday, I did the Grouse Grind, which is only a couple KMs. Or, according to Garmin, 1.9 KM. And third, my knee is acting up. This is the very frustrating since bad knee is right, but current acting up knee is left. 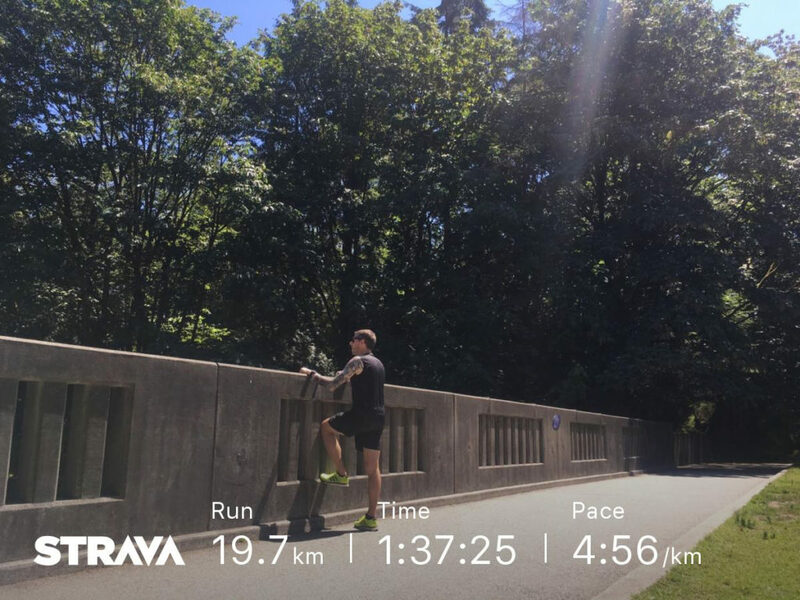 So I’m trying to be careful with my load, while at the same time loading for Victoria Marathon, and staring down a 21.1 KM race in Kamloops in seven days. I was born and raised in Kamloops, but I’ve never run there unless you count my single day on the high school track team where I ran the 200 and 400 metres 25 years ago. So we’ll see what happens on July 22. The course is flat and fast, but it’s at elevation (only 345 metres, but that’s about 300 more than I’m used to) and, as usual for summer in B.C.’s interior, it’s going to be about 34 C and forest fire smokey. Should be great fun.